The family at the top of the mountain. Skiing is a winter activity we can all do together. Skiing earlier this winter at our nearby ski hill where we have been developing our sit skiing skills. For people of a certain age, these lyrics immediately conjure up the TV show Cheers and an overweight man walking into the bar to be greeted by the staff shouting his name. Reminiscing about eighties TV shows is not my kind of thing, but I couldn’t help thinking about these lines last week. After last year’s “winter that wasn’t” for us, we were determined to resume our regular activities this year. Deane has healed from last year’s hip surgery and is getting stronger, so when the snow fell, we got out our skis. Part of our ski tradition is that we load into the car and drive 10 hours to Sunday River Ski Resort and the incredible folks at Maine Adaptive Sports and Recreation. Last week, we did it again. Monday morning, we rolled into MASR’s slopeside headquarters. With the coming and going of the multitude of volunteers and the transition of staff, it’s slightly different every year. But this year, it really was like Norm arriving at the bar. Deane was greeted by name. They said they had missed us last year. And they were truly glad to see us. It was a great welcome, one that was pleasantly unusual. Unfortunately for non-verbal disabled kids, there aren’t many places that greet you so enthusiastically. But then again, Maine Adaptive isn’t like most places. 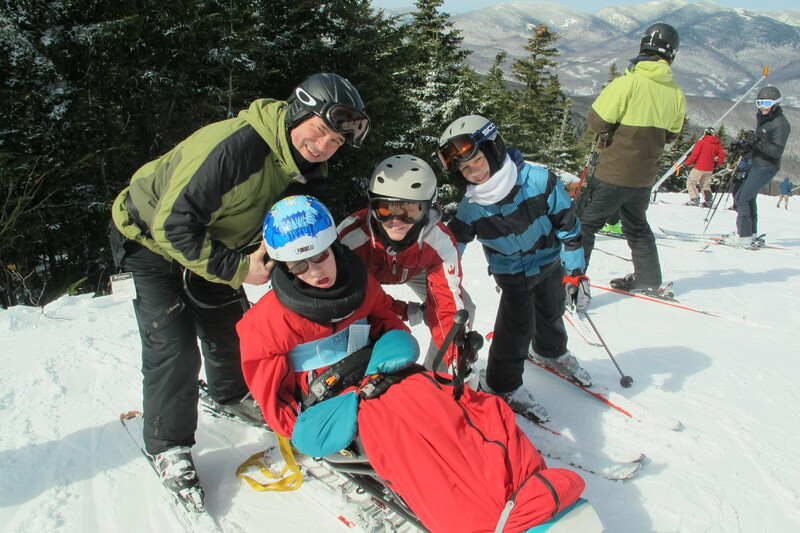 Begun by an orthopaedic surgeon who was amazed to see a patient with cerebral palsy skiing on the slopes of Sunday River, it is committed to providing both winter and summer recreational activities for adults and children with disabilities. I couldn’t agree more. These are the people who showed how we could ski as a family. By patiently teaching my husband and a family friend how to take Deane down the mountain in a sitski, we found a winter activity we could all do together. Each morning, Deane would ask who was skiing with him. He wanted to make sure we were all going to go flying down the slopes with him. He loves the speed and the togetherness. Being able to share his skiing stories with people brings a huge smile and an active engagement from Deane like few other subjects. This was our fifth time at Maine Adaptive (formerly Maine Handicapped Skiing). Having missed last year, it was clearer than ever how lucky we are to have found this organization. To the staff and 450 volunteers who provide such amazing support to so many individuals and families, thank you. It is worth the drive to go where people know your name.